Why Texas Longhorns? – Texas Longhorns Australia Inc.
You are here: Home / About Texas Longhorns Australia Inc. / Why Texas Longhorns? 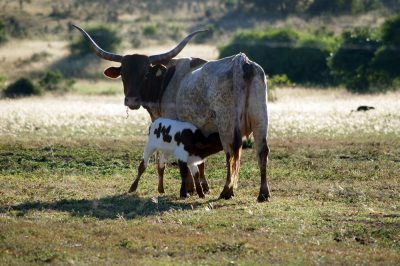 There are many benefits to breeding Texas Longhorn cattle. Texas Longhorns and calving ease go hand in hand. In recent studies, Longhorns had the highest unassisted birth rate of all studied breeds (99.7%) and the lowest birth weight. This translates into reduced calving stress on the first calf heifer, impressive calving percentages, vigorous calves and extra profits for cattle breeders through reduced labour and more live, saleable calves. 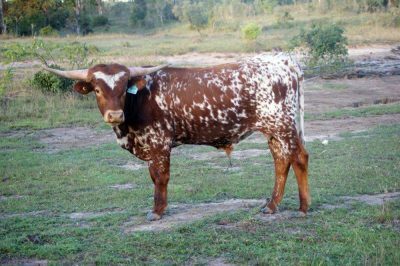 The trait of easy and uncomplicated calving is of enormous benefit not only to the purebred Texas Longhorn breeder but also to people considering using Longhorns in a crossbreeding program. Dairy industry heifers bred to a Texas Longhorn Bull deliver a small calf. With a no stress birth they are in better condition and this allows them to produce more milk. Texas Longhorns are known for their high fertility and live birth percentages. Most animal scientists agree that high fertility rates are the single most important economic trait in the cattle industry. In the case of Longhorns, the process of natural selection over the past few hundred years assured that only the most fertile bulls and cows would contribute to the gene pool. Modern day Texas Longhorns retain this influence from their recent ancestors. Texas Longhorn bulls can produce from an early age. You do not have to wait to buy a 2 year old bull when Longhorn bulls start producing from 12-13 months of age (or earlier). Heifers are able to be joined to calf at 2 years of age. They are productive from an early age. This coupled with their ease of calving means you are producing live offspring earlier in your operation. Longhorns typically live well into their late teens and often into their twenties. Longhorn cows have as much as twice the production capacity of other breeds. In commercial terms, this longer productive life means that breeders can retain fewer heifers to maintain their herd size. Allowing more calves to be marketed each year. The Hardiness and adaptability of Texas Longhorn cattle sees them thrive in all areas, from semi-arid regions to snow covered paddocks. They can efficiently process many grassland products which go untouched by other breeds. This ability to browse efficiently on whatever pasture is available enables graziers to achieve a higher than normal land carrying capacity with resultant revenue enhancement. Texas Longhorn cattle have a natural resistance to diseases compared to other cattle, enabling you to use less chemicals and reduce the ongoing costs of running your cattle herd. 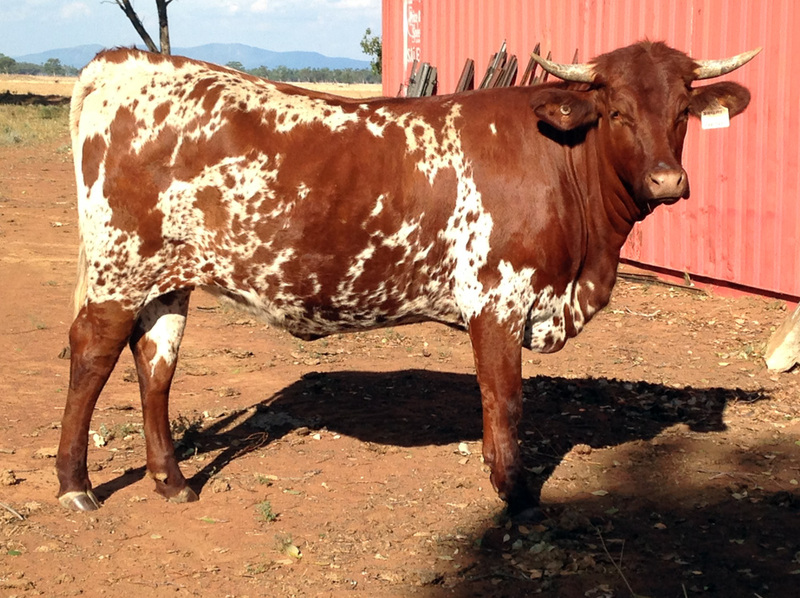 Crossing other breeds with Texas Longhorns produces excellent hybrid vigour in the offspring. They are known to perform well in feedlot and grass fed environments. Longhorn/Santa Heifer pictured at 16 months of age showing hybrid vigour. Longhorn cross steers show excellent results when put through feedlot operations. Regularly yielding larger carcass percentage when compared to other breeds. Today’s health-conscious consumer doesn’t have to avoid tender juicy steaks. Not only is Longhorn Beef leaner than that of other breeds, it is also lower in saturated fats. The flavourful Longhorn Beef has less cholesterol and calories than chicken. Definitely good news for a healthy lifestyle. No other breed of cattle can boast the range of colours Texas Longhorns can produce. From solid blacks, brown and white to roam and lacey faced, spot, patches, and flecks of all colours and patterns. Calving time is the most exciting time for Texas Longhorn breeders, you never know what colour and pattern each new calf will provide. As for the horns, everyone wants a big rack hanging over the fireplace or in the office or the shed. Texas Longhorn cattle can have horn spans ranging into the 60-90 inch mark. Rodeo and time event organisers, Cowboys and Cowgirls cannot get enough longhorns. Their horns are an essential requirement for rodeo time-event stock they are a hardy breed and can run and run event after event, unlike other breeds. Nothing turns heads or attracts a clicking camera more than a Texas Longhorn Trophy Steer. From a magical coloured coat adorned with a big set of often twisty horns. They are unique front paddock cattle. Almost every Texas Longhorn Breeder always has one or more trophy steers to greet you when you visit their property. 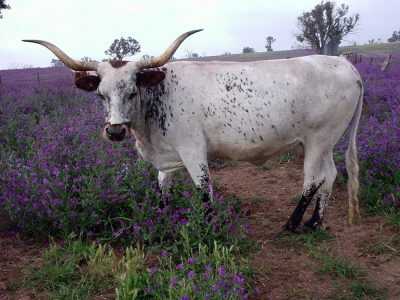 The Texas Longhorn breed is an ideal inspiration for artists around the world. 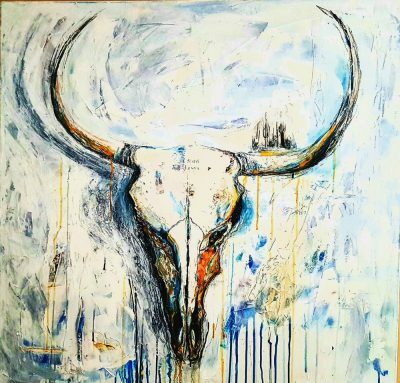 In Australia there are many artists that love to paint Texas Longhorns because of the interesting array of colours that nature blesses them with at birth. Other talented artists decorate the horns and many adorn the walls of the Texas Longhorn enthusiast. The TLA Breed Standards are an important part of the strategy for continual improvement. To view a copy of the Breed Standards please refer to our Downloads page.